Artichoke season has come around again. My own artichoke plantation—six plants circling the clementine tree—looks to be thriving, but so far has not sent up any artichokes. 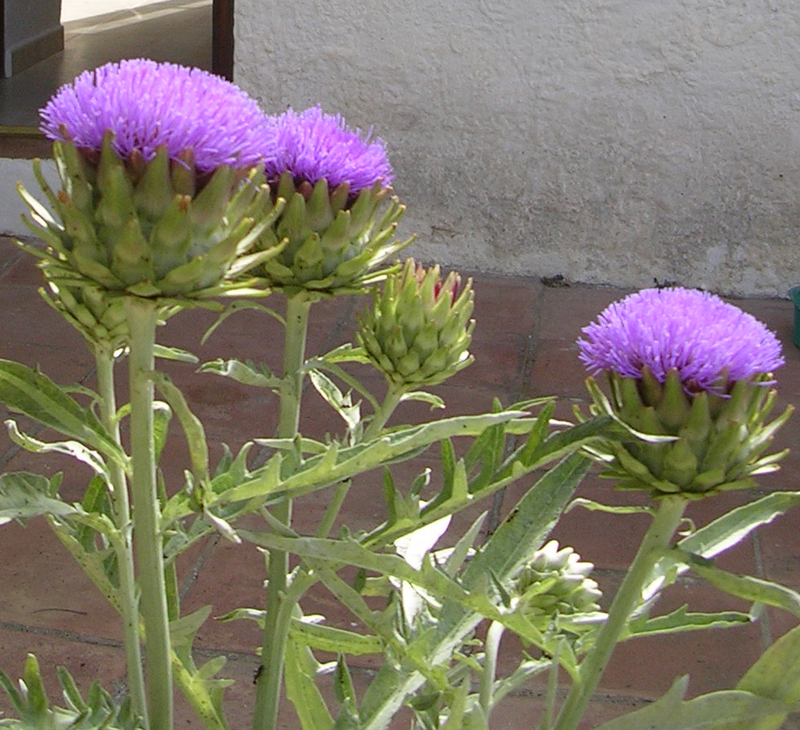 Artichokes are the flower buds of an edible thistle. Last year, when the ants and aphids took over the plants, I let the buds mature and open to dramatic purple thistle flowers on tall stems. They make a nice addition to dried flower arrangements. But with an abundance of this classy thistle, I’m delighted to try some more elaborate recipes. This artichoke recipe, of Spanish Sephardic origin, with a lemon and orange marinade, I especially like because I can make it in quantity and keep the trimmed artichokes in their cooking liquid in the fridge for up to a week. 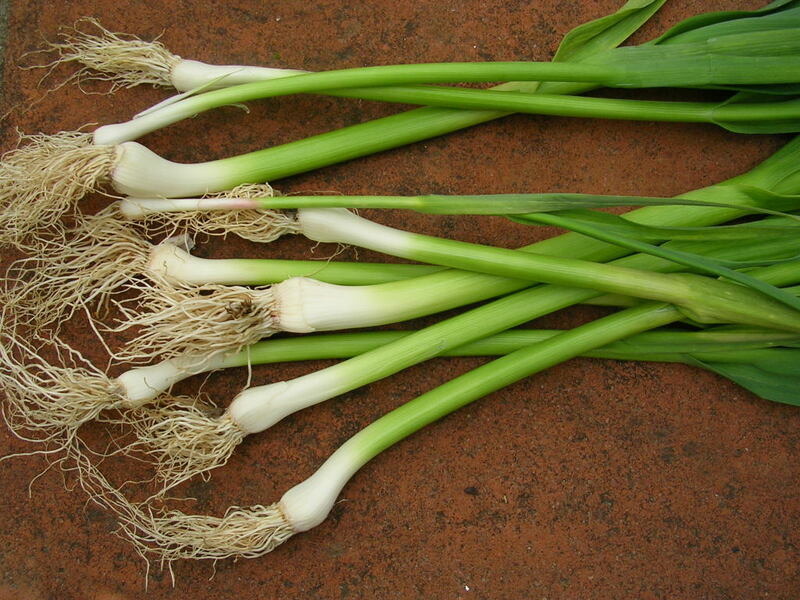 Very handy for tossing into a mixed salad or creating an elegant starter. The artichokes can be prepared a day in advance. Refrigerate them in their liquid. Bring to room temperature before draining and serving. Put the juice of 1/2 lemon (about 1 tablespoon) in a bowl and fill with water. 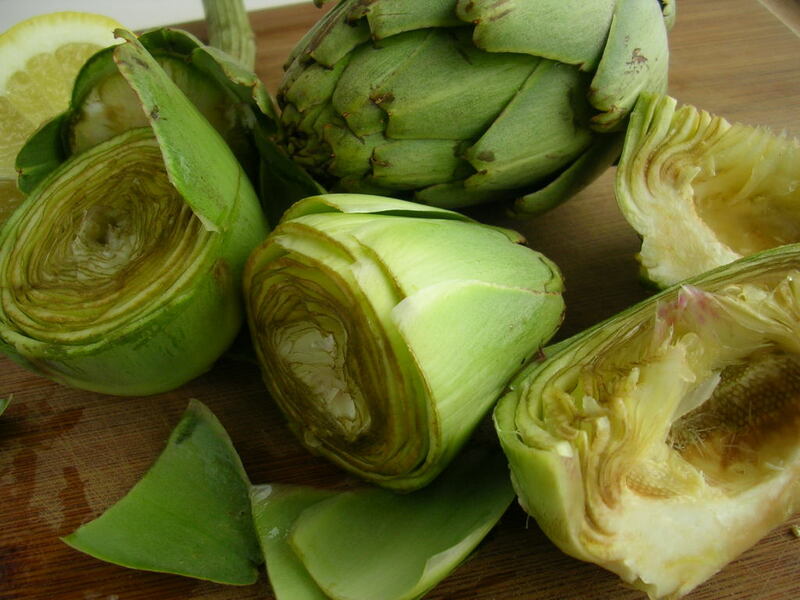 Snap off 2 or 3 layers of outer leaves from the artichokes and cut them crosswise 1/3 the way up from the bottoms, discarding the upper leaves. Cut the bottoms in half and, using a spoon or melon baller, scoop out and discard the fuzzy choke. Place each artichoke bottom as prepared into the lemon water. 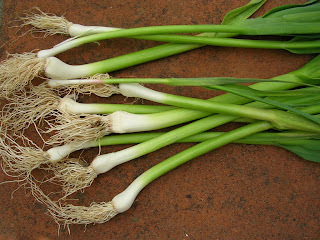 If desired, the stems can be peeled and cooked with the artichoke bottoms. Place the artichokes in a saucepan just large enough to hold them. Peel and slice 1 lemon and 1 orange and tuck the slices in with the artichokes. Pour the juice of remaining half lemon over them. Cover with 6 cups of water. Add the salt, oil and slivered garlic. Bring to a boil, then simmer, covered. 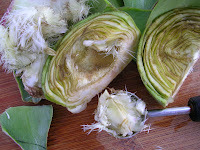 Artichokes are done when an outer leaf pulls off easily, about 20 minutes. Remove and let them cool in the liquid. 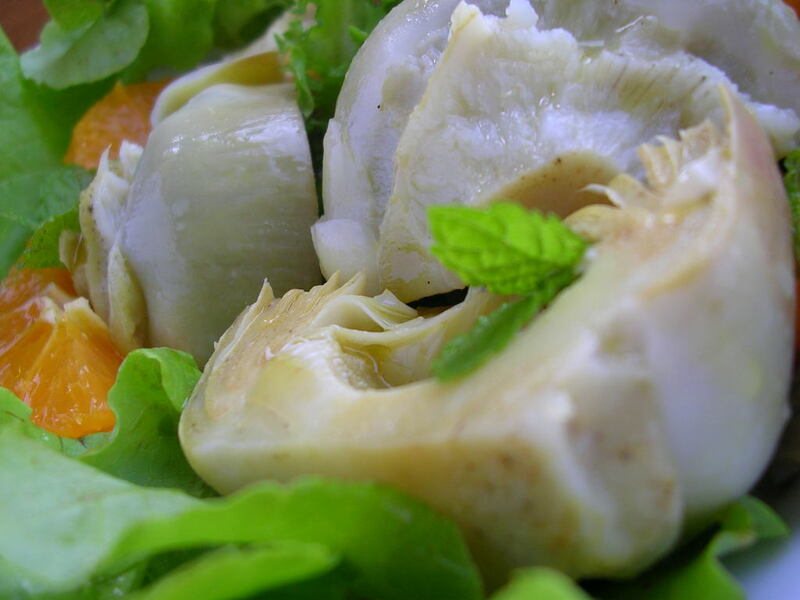 Before serving, drain the artichokes in a colander, discarding the pieces of cooked orange and lemon. 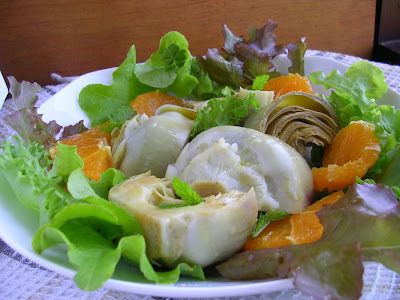 Arrange the artichokes on a bed of endive or lettuce leaves. Peel and slice the remaining orange and tuck the slices in with the artichokes. Sprinkle with mint. 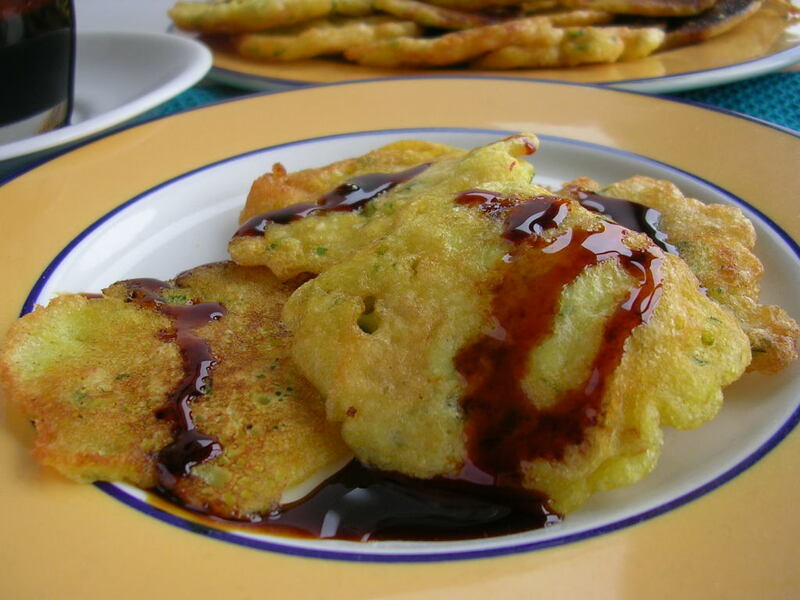 Tortillitas are pancake-like fritters of salt cod, drizzled with molasses. I hear the solemn drumming. The village streets are slicked with candle wax after processions have passed. Holy Week is here again. That means it’s time again for bacalao—dry salt cod—the meal of choice for Viernes Santo, Good Friday. Truthfully, cooking salt cod but once a year is not sufficient to really get a handle on it. Last year I prepared and photographed my salt cod recipe before tasting it. Later, I added tasting notes to the blog, saying that the cod needed additional soaking time before cooking. You can read Part 1 of “IF IT’S GOOD FRIDAY, IT MUST BE BACALAO here Actually, I did make salt cod another time and it wasn’t even Good Friday, as a delicious dip called brandada that is ever so easy. That recipe is here. 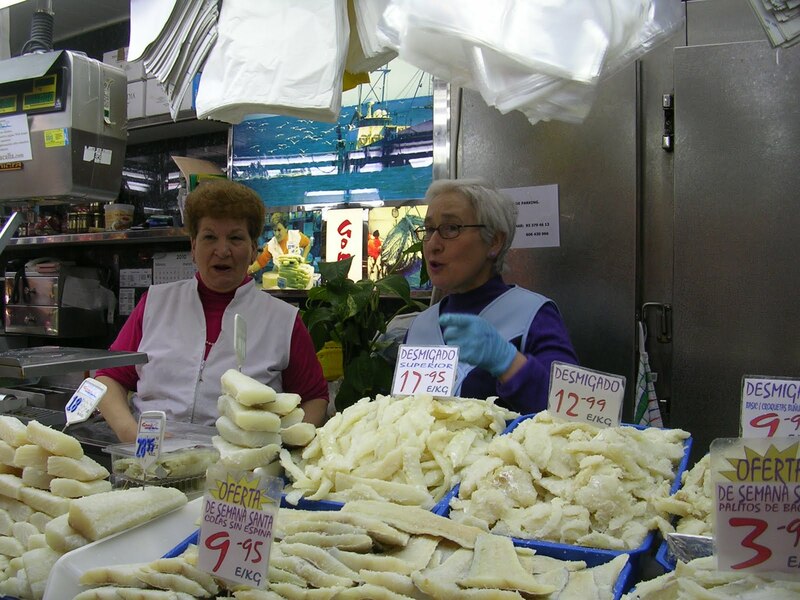 Bacalao--salt cod--at the Barcelona market. Last year, having just come back from a few days in Barcelona, I was inspired to prepare a Catalan dish with salt cod, bacalao a la llauna. This year, for Bacalao Part 2, I am making a traditional Málaga dish that’s been popularized in tapa bars--tortillitas de bacalao con miel de caña, cod fritters with molasses. If this sounds unusual, trust me, it’s absolutely brilliant. Flaked cod is combined in a saffron-tinged batter, fried in olive oil, then drizzled with just a little dark-sweet molasses. The sweetness complements the cod’s saltiness. Delicious. Why molasses? In southern Spain, in the coastal areas of Málaga and Granada, sugar refineries, established at the end of the 1500s, thrived for several hundred years, spawning related industries such as rum distilleries. Cane syrup, a light molasses, entered the local culinary tradition. Instead of molasses, you could use honey, corn syrup or even your favorite pancake syrup in this recipe. In fact, you need very little. It is the intriguing contrast of salty and sweet that makes this an outstanding dish, typical of Holy Week in Málaga. 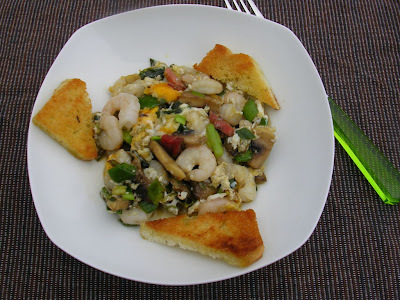 Tasting notes: I used small, boneless pieces of salt cod for this recipe. Twenty-four hours of soaking was sufficient, leaving just enough salt to contrast with the batter. Taste the cod after soaking--if it's not salty enough, add salt to the batter. Scrape off surface salt and wash the fish in running water. Put it in a bowl and cover with water. Soak the bacalao, covered and refrigerated, 24 to 36 hours, changing the water three times. Each time you change the water, wash the fish under running water, squeeze it gently and wash out the container. After soaking, place the pieces of bacalao on a clean towel and cover with another to soak up excess water. Remove scales and bones. The skin may be required for some dishes, as its gelatinous quality thickens the sauce. 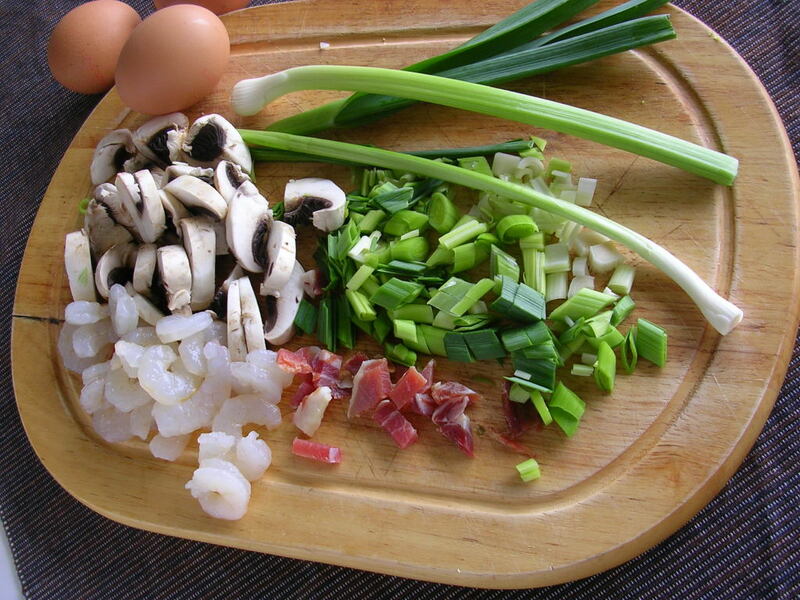 Big chunks are usually cooked whole, but scraps can be cooked, de-boned and used in fritters and fish balls. To pre-cook bacalao, place it in enough water to cover and bring it just barely to a simmer. Hold it at a simmer for five minutes. Saffron, garlic and parsley flavor the cod fritters. Drain the salt cod and put it in a pan with water to cover and bring just to a simmer. Do not boil. Remove from heat. Drain and save the liquid. When the cod is cool enough to handle, remove any bones and skin and flake or chop the fish. Measure 1 cup of the reserved liquid. Add the saffron to it and allow to infuse for 10 minutes. 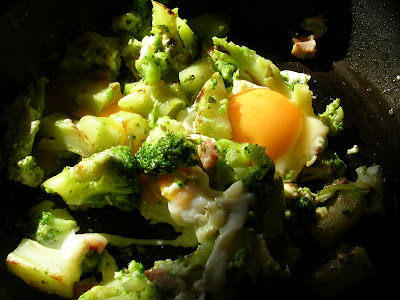 Combine the parsley, garlic, saffron and egg yolk. Beat in the reserved saffron liquid, then the flour combined with the baking powder. Add the flaked cod. The batter should be the consistency of pancake batter. Let the batter rest for 15 minutes or up to 2 hours. Beat the egg white until stiff and fold into the batter. Heat oil in a skillet to a depth of 1/4 inch. Drop batter by tablespoons, turning to brown on both sides. Add additional oil as needed so that the bottom of skillet is always covered. 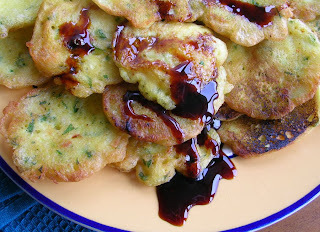 Drain the fritters on absorbent paper. Serve them hot or room temperature, drizzled with molasses. Sweet molasses complements salty cod. 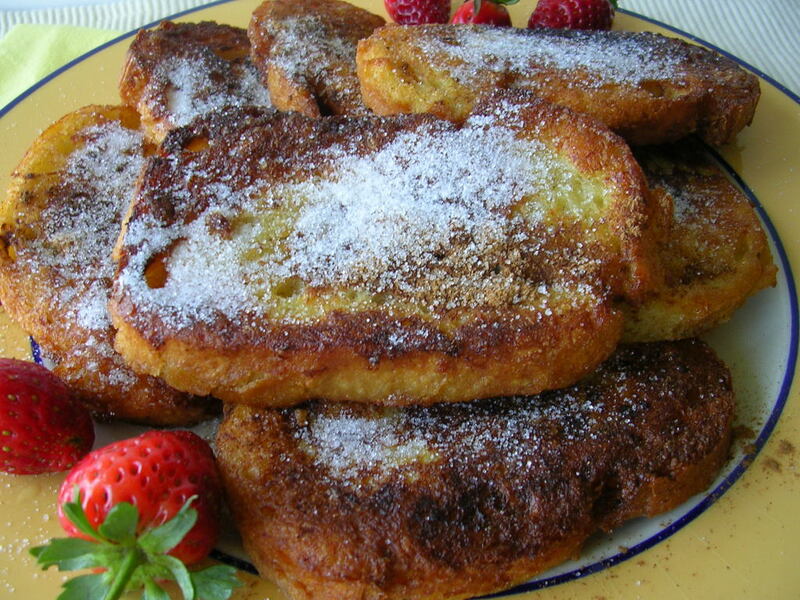 Torrijas are cinnamon-scented slices of fried bread. 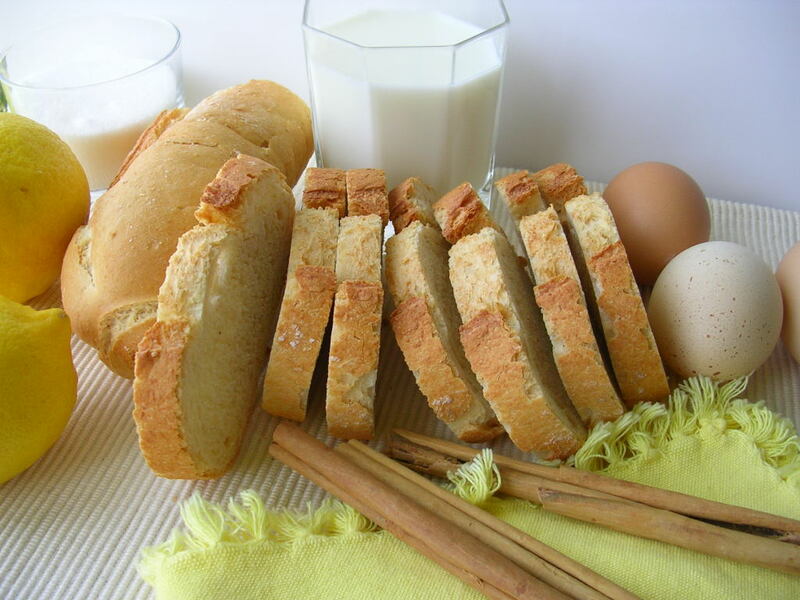 This week all the local bread and pastry shops display trays of sugared or honeyed slices of fried bread dusted with cinnamon called torrijas. Torrijas are somewhat like “French toast,” but in Spain they are served as dessert or snack, not breakfast. In Andalusia and La Mancha, torrijas are absolutely essential during Holy Week and Easter holidays. I have wondered if—in these lands where 600 years ago Christians and Jews lived together as neighbors—this custom derives from the Jewish tradition of using up all of the hametz, or leavened bread, before Passover—the springtime festival that coincides with Holy Week. Possibly conversos—converts to Christianity—brought with them to a new religion some of the customs of the former. In any case, torrijas bring such a welcome sweetness to the austerity of Lenten foods. The basic preparation: dip or soak thick slices of stale bread in sweetened milk, wine syrup or sweet wine, then into beaten egg. No, don’t mix the milk and egg together. Fry them in olive oil until golden. Sprinkle with sugar or drizzle with honey boiled with a little water. Sprinkle with lots of cinnamon. Serve at room temperature. Place the slices of bread in one layer in a shallow pan. In a saucepan heat 2 cups of milk with 1/2 cup sugar, lemon peel and cinnamon stick until sugar is dissolved. Remove from heat and allow to cool. Strain the milk. Pour the milk over the bread and allow to set until liquid is absorbed, about 5 minutes. Beat the eggs with the remaining 2 tablespoons of milk. Place eggs in a shallow bowl. Heat enough oil in a large, heavy skillet to completely cover the bottom. Dip the slices of bread into the egg on both sides. Fry them until browned on both sides. Remove to a platter. Add additional oil to the skillet as needed and continue frying the remaining slices of bread. When all the bread slices are fried, sprinkle them with cinnamon and sugar or drizzle with boiled honey. Serve the toasts at room temperature. Ferran Adrià, the Picasso of modernist cuisine, plays with gelification, liquid nitrogen, foams, smokes, what he terms “techno-emotional food”. Delicious is sometimes beside the point. It’s all about thrill, excitement, creativity. And technique. Dinner as high art. I’m not a chef. 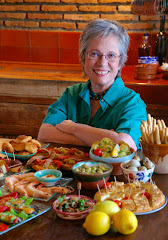 I’m a home cook and I learned Spanish cooking from home cooks. 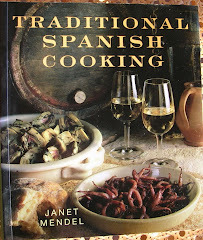 I cook and write about the traditional Spanish kitchen. While I have yet to try sous-vide or spherification, I know lots about the tools and techniques of the traditional Spanish kitchen. And, from the traditional kitchen—the mortar and pestle. Here’s what I wrote about this technique—plus a wonderful recipe for chicken in pepitoria, a sauce of almonds and saffron. 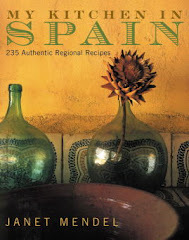 The most basic utensil in the traditional Spanish kitchen is the mortar and pestle. Of weighty granite or marble, of gnarled olive wood or shiny brass, the mortar holds pride of place on the kitchen shelf. Before the advent of electric blenders, it was a tool in daily use, the starting point of many recipes. The tool is the technique—a few peppercorns, garlic, a wisp of saffron are crushed in the mortar and added to a simmering stew. Here is where flavor begins. Each region has developed distinctive recipes using the mortar. Andalusia has its ajo blanco, cold almond soup, and chicken in pepitoria sauce. La Mancha has morteruelo, a sort of pâté. Catalonia has romesco sauce and picada, a ground nut mixture for flavoring fish stews, chicken and meat dishes. Andalusians favor the almirez, a small brass mortar and pestle. So beloved is the sound of the almirez that it is used as a rhythm instrument in traditional folk music. 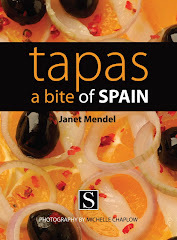 In a collection of recipes from Málaga, the gastronomic writer Enrique Mapelli recounts how making ajo blanco was a summertime ritual. 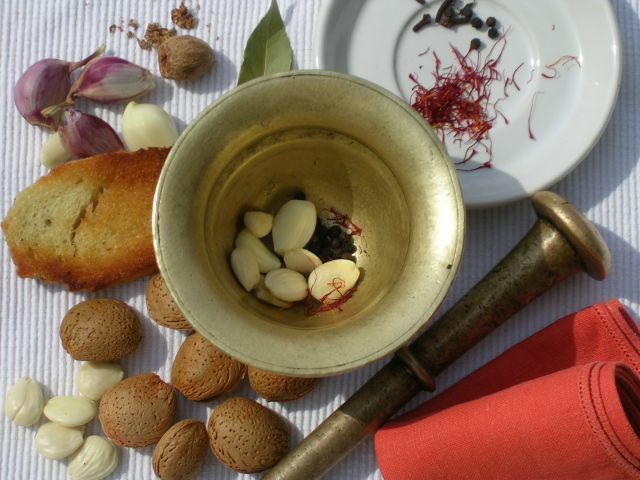 Village women would sit in their doorways with the almirez, pounding garlic, almonds and bread to a smooth paste. Olive oil beaten into the paste created a thick emulsion, to be thinned with vinegar and cold water and served with sweet moscatel grapes. Many cooked dishes also required the almirez. A standard preparation, used for fish, poultry and meat, begins with frying until crisp a slice of bread, a few almonds, and a clove or two of garlic. Next, small hard ingredients—a few peppercorns, a single clove, a few threads of saffron—are ground in the brass mortar. 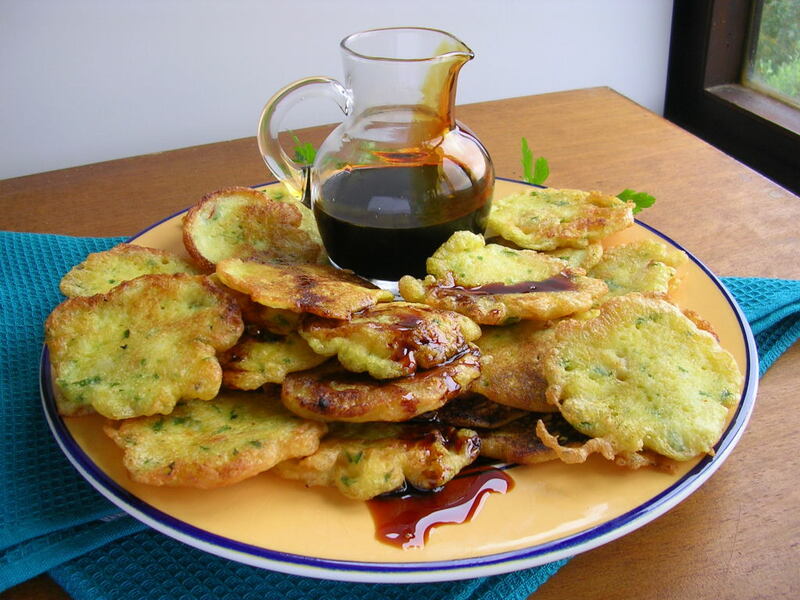 Then, the fried bread, almonds and garlic—plus a clove of raw garlic, for subtle variations in flavor—are added to the mortar and “processed” to make a paste. 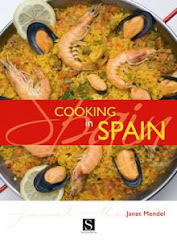 Diluted with white wine, the mixture goes into the cazuela where chicken or meat has been browned. The mortar mixture creates the sauce, known as pepitoria, both thickening and seasoning it. Catalan picada sauce, used to flavor suquet, a seafood stew; rabbit dishes, and a sumptuous surf and turf dish of chicken and lobster, is prepared in a large granite mortar. Almonds and sometimes pine nuts or hazelnuts are crushed with garlic, parsley, bread and a pinch of chile pepper. Sometimes the picada is thickened with the fried liver of fish, rabbit or chicken. Pounded chocolate adds a mysterious background flavor to the mixture. A mortar is also essential for preparing the famous Catalan romesco sauce. Dried sweet peppers called ñoras are ground up with hazelnuts and garlic, sometimes roasted tomatoes, then olive oil is beaten in to thicken the sauce. 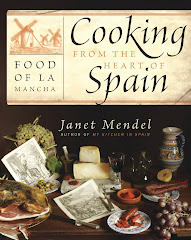 The morteruelo of La Mancha is a traditional way of preserving pork liver and game birds. After a matanza, hog slaughtering, the liver was cut into pieces and fried, then mashed in the mortar. Combined with bread for thickening, pieces of chopped partridge and cinnamon and caraway seeds, it was simmered until very thick, then packed in pots to keep in a cold place. Rub the chicken pieces with salt and pepper, then dredge them with flour. Shake off excess. Heat the oil in a skillet and fry the almonds, 4 cloves of garlic and bread slices until they are golden. Skim them out and reserve. In the same oil, brown the chicken pieces very slowly on all sides. Remove chicken to a cazuela. Add onion to remaining oil and sauté until softened. In a mortar, grind the clove, peppercorns and saffron with the salt. Mix with 1 tablespoon of water. In a blender, place the fried garlic, 2 cloves of raw garlic, almonds, bread, parsley and some of the wine. Blend to make a smooth paste. Blend in the spice mixture. Add the mixture from the blender to the onions with the remaining wine and broth. Bring to a boil, then pour over the chicken pieces. 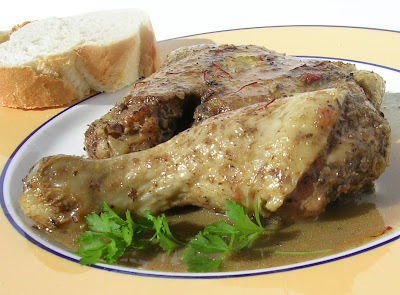 Cook the chicken slowly until tender, about 2 hours, stirring occasionally. Add additional broth if sauce is too thick. Mash the egg yolks with the lemon juice and a little of the sauce and stir into the casserole to thicken the sauce. Serve the chicken garnished with fried slivered almonds and triangles of fried bread.